St. Andrew There was a surprising lack of medieval images of St. Andrew available online. St. Andrew (d. 60 ce) was a brother of St. Peter, who later became the founder of the Roman Catholic Church. They both belonged to the Twelve Apostles (John 1:40). But in early Byzantine tradition Andrew was prominently called protokletos ("first-called") because he was the first one to be summoned by Jesus of Nazareth into His service. The Russian Primary Chronicle described Andrew's early missionary activity around the Black Sea going from Sinope, Kherson and then north to Novgorod. Eusebius’ Church History (HE III:I) also mentioned his life and work around Scythia, a region to the north and northeast of the Black Sea. Part of this area came under the rule of Kievan Rus between the 10th and 12th centuries. The Chronicle affirmed that in 988 Prince Vladimir ordered a mass conversion from paganism (deity Perun) to Christianity. St. Andrew was also featured in the founding of the city of Kiev and by tradition was adopted as Kiev’s patron saint. 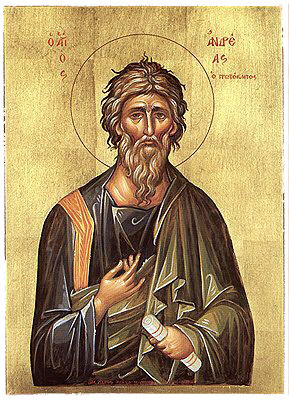 In ecclesiastic history, St. Andrew was considered a counterpart and symbol of the Eastern expansion of Orthodox Christianity as opposed to the rival Roman Catholic church expanding in Western Europe. Russians notably adopted St. Andrew as their patron saint, and NOT St. Peter. It was a statement of Russia's favoring Byzantine orientation ("New Rome") over the Papal or Western form of Christianity (old Rome)–-St. Peter went West and St. Andrew Went East. Even in St. Andrew’s death, he continued to reflect the schism between the Christian churches. Actually, legend has it that he was martyred on an x-shaped cross in the city of Patras (Patrae) on the northern coast of the Peloponnese in Greece. In 357 by the order of Emperor Constantine (son of Constantine the Great) St. Andrew’s relics were removed from Patras and re-interred in the Church of the Holy Apostles in Constantinople where he was the founder of the Great Church of Christ. However, in the fifteenth century his "head" relic was ironically reunited with his brother, St. Peter, in the Vatican, but it was much later returned by Pope John Paul VI (1966) to the Church of St. Andrew in Patras as a sign of goodwill with the Greek Orthodox Church. That church is now the site of a special shrine devoted to the relics of St. Andrew. Peculiar enough, St. Andrew is also Scotland’s patron saint. His cross, called the saltire, is depicted in the Scottish national flag. Tradition suggested that a Greek monk called St. Rules brought his relics to the "ends of the earth" for safe-keeping – Scotland was as far as the end of the known world. In this case, the wikipedia entry on St. Andrew is actually a good starting point for further research. These websites give some explanation why St. Andrew became Scotland’s patron saint.